The purpose of the Inclusive Society initiative is to promote and facilitate activities that go beyond the respective mandates of the partners involved and that optimize each partner’s resources in order to attain objectives beyond what each of them can achieve individually. Create the conditions needed to allow intersectoral work and collaboration by the partners, without trying to make each participant an expert on the subjects involved. 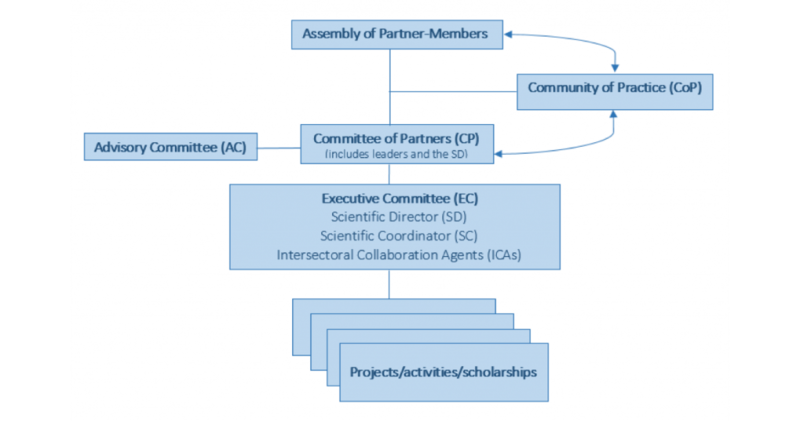 The Assembly of Partner-Members consists of the partners of the intersectoral initiative. It will be held on an annual basis as a forum for discussion and a place to inform all the partners and their members. From the outset, the Assembly will identify representatives of the partners who will constitute a Community of Practice. The community of practice will have a mandate to encourage stakeholders to share experiences and perspectives, and to inspire research efforts within the intersectoral initiative while facilitating the implementation of research findings in clinical practice and societal changes. The Committee of Partners will be made up of the four leaders of the initiative, the Scientific Director and five representatives of the partners. The Committee’s role will be to determine the initiative’s directions and ensure its sound management. It will report annually to the Assembly of Partner-Members. An Advisory Committee will meet with the partners twice annually to provide outside opinions to the Committee of Partners on operations. This committee will consist of investigators from each sector (the social sciences and humanities, the natural sciences and engineering) and experts on the four themes. The Executive Committee consists of the Scientific Director along with the Scientific Coordinator and four intersectoral collaboration agents (ICAs) (two from Montréal, one from Quebec City and one from Sherbrooke). The ICAs will have a mandate to liaise between the partners and the management of the initiative’s projects.